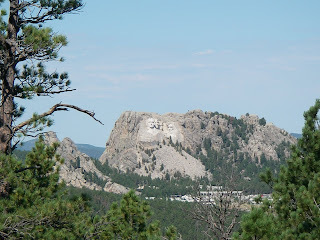 Monday, Sept. 15th, we drove to the Black Hills of S.Dakota, and at Custer State Park we rendesvoused with Ray and Brenda. We camped there with our friends for five days and explored the area. One of our first orders of fun was to visit Mt. Rushmore. The above photo gives an idea of the setting and scale. 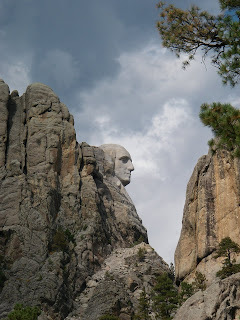 In this next picture you will notice a person rappelling down Washington's forehead. We were told that he was inspecting for cracks in the stone that would have to be filled to prevent freezing water from defacing (har, har, har..) the sculpture. As we drove away, we rounded a corner and were presented with this profile of Washington. 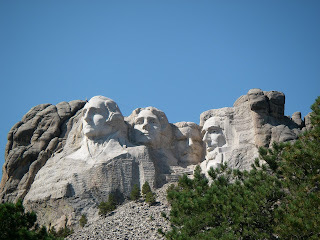 It is an amazing monument that makes you think about the contributions of each of these men. The sculptor felt they represented the beginning, the growth, and ideals of our country. He worked on the monument for 17 years and the work on it ended in October 1941. I'm just catching up with your blog and feel like an "armchair traveler" as I read about the great things you're seeing on your return to California. Good stuff. Hey, Dave, a note from home: we ran the first grape samples of the season this week (Pinot/Zabala) and sorely miss you! Hi! Well, your homeward bound...still having fun, I see. :)We went to dinner and the movies with Daniel last night, and he told us that you were headed to the cabin. I have a favor, I left my stainless Kitchen Aid Mixer bowl in the cupboard - can you please bring it to Salinas for me? See you soon!